Sealegs Kayaking Adventures, based on Vancouver Island, B.C., starts the morning by serving its guests this creation. Sealegs' recipes come from Edible Canada, a culinary tourism company that champions Canadian products. Heat a charcoal grill to medium-high (450°) or set up a camp stove and use medium heat. Whisk egg, milk, sugar, cinnamon, and 1/2 tsp. vanilla together in a large bowl. Stir mascarpone, remaining 1 tsp. vanilla, and the liqueur together in another bowl. Spread mascarpone mixture over 4 bread slices; top with remaining slices. Cook maple syrup and berries in a small covered saucepan until berries start to break down, 5 to 10 minutes. Remove from heat. Heat a large heavy frying pan or 2 smaller ones; swirl butter in pan(s). Dip sandwiches in egg mixture, then cook, turning once, until crisp and browned, 4 to 8 minutes total. 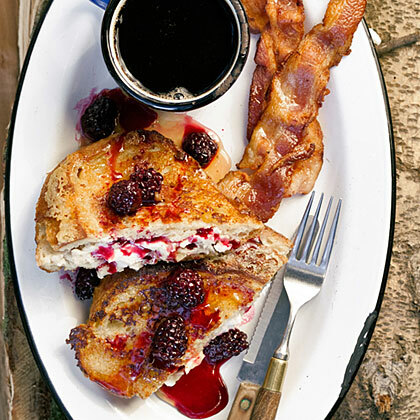 Serve French toast with syrup and bacon.